Find the best accommodation deals in Santo Domingo right here! Religion: Roman Catholic, small Protestant and Jewish minorities. Climate: Hot with tropical temperatures all year. Rainy season is from June to October. Hurricanes possible during this period. 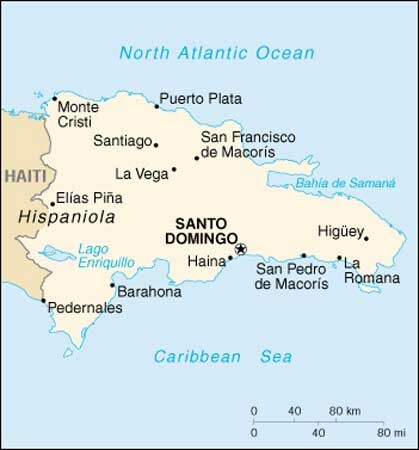 The Dominican Republic is in the Caribbean, sharing the island of Hispaniola with Haiti and constituting the eastern two-thirds of the land. The landscape is forested and mountainous, with valleys, plains and plateaux. The soil is fertile ith excellent beaches in the north, southeast and east coasts, rising up to the mountains.